Tribhuvannatha Prabhu left this world on October 16th, 2001. He was my best friend. Since meeting him in India back in the 70's, my life has never been the same. A few years older than me, Tribhuvannatha graciously took me under his wing and nurtured my fledgling -- and always shaky -- spiritual life. I could never understand why he was so kind to me, but I'm nonetheless very grateful indeed. It is said that a Vaisnava, or devotee of the Lord, is an ocean of mercy; and Tribhuvannatha Prabhu exemplified that to no end. What other explanation is there for such undeserved comaradarie and friendship? To this day, I'm utterly humbled and awed by the magnitude of his Godbrotherly love. "Yasya deve para bhaktir yatha deve tatha gurau. It is not by education or grammatical knowledge you can learn anything. No. It is by the grace of the Supreme Personality of Godhead. And that grace comes down through the grace of guru. That grace also does not come directly. We should not be neglecting this point. Yasya deve para bhaktir yatha deve tatha gurau tasyaite kathita hy arthah prakasante mahatmanah. Things become revealed by devotion, not by so-called education. No. Ciram vicinvan. Na canya eko 'pi ciram vicinvan, prasada-lesanugrhita eva hi. By little prasada, satisfaction... In many places these things are stated. Yat karunya-kataksa-vaibhavavatam gauram eva stumah. Karunya-kataksa. Not complete karunya, but kataksa, simply little glancing, he becomes so great, kaivalyam narakayate tridasa-pur akasa. Therefore Visvanatha Cakravarti Thakura says, yasya prasadad bhagavat-prasadah. Not that bhagavat-prasada is achieved by education and grammar. No. Yasya prasadad bhagavat-prasadah. By the mercy of guru one can achieve. That is just like a common word, "If you love me, love my dog." So you cannot approach Krsna without loving His dog, His servant. Satam prasangat. A person who is trying to distribute the message of Krsna, he is very, very dear dog of Krsna. Na ca tasman manusyesu kascin me priya-krttamah. He is very... It doesn't matter how far he is advanced in education, how far he has learned grammar. These are not the things. The thing is how far he is working to carry out the mission of Krsna. Then one has to receive Krsna's mercy through the bona fide servant. Krsna cannot be bluffed by so-called education and grammar. Krsna is not so... Bhaktya mam abhijanati. He never says "By grammar or by education one can understand." Never says. Bhaktya mam abhijanati yavan yas casmi tattvatah. We should be educated, we should be very careful, but real thing is bhakti. Anyabhi... Bhajate mam ananya-bhak, sadhur eva sa mantavyah. Api cet su-duracarah. Many places it is said. Tad-vag-visargo janatagha-viplavo yasmin prati-slokam abaddhavaty api. Even a bhakta writes something which is not very grammatically, rhetorically correct... Tad-vag-visargo janatagha-viplavah, namany anantasya yaso 'nkitani yat. But because he has tried to broadcast the glories of the Lord, even not in perfect language, that is his qualification." During the years of our association, Tribhuvannatha liberally showered me with Prabhupada stories and nectar. My all-time favorite is when Srila Prabhupada unexpectedly rubbed Tribhuvannatha's head, displaying great affection for his devoted son who desired so much to please his beloved spiritual master by preaching Krsna consciousness anywhere and everywhere. Often, while recounting this story, Tribhuvannatha's eyes teared up and his voice faltered. He never spoke of this pastime with arrogance or egotism. In fact, he seemed more astounded than anyone that such a rare exchange of transcendental love between guru and disciple had occurred with him being the most fortunate of recipients. What a blessing for me to hear it from his own lips so many times. For this, I'm eternally grateful to him. Not only did Tribhuvannatha relish receiving the divine mercy, but he loved to spread it too. I still cherish Prabhupada's slippers and gumpsa which he so kindly gave to me without hesitation. And despite my grossly materialistic consciousness, I can't help but feel blessed recalling the time when he gave me his own personal Gaura-Nitai Deities. Although small in size (for traveling), Their transcendental beauty is beyond compare. Tribhuvannatha loved to share his good fortune with one and all. Tribhuvannatha Prabhu was a very loyal and faithful friend. One time someone pointed out one of my innumerable faults. I wasn't there at the time, but a devotee later informed me that Tribhuvannatha had immediately jumped to my defense, saying that he would always love and respect me as a Godbrother -- "no matter what." Now that's a friend! There were so many special times that we shared together in India, England and a number of foreign countries. The first thing we did when meeting up was offer obeisances to one another, and then the nectar flowed with Prabhupada-katha. Sometimes due to flight delays and airport hassles, we'd arrive at our destination very late at night or early in the morning; yet still, we'd talk about Prabhupada and have a kirtan together, often in the strangest of places and circumstances. It mattered none. Prabhupada and Krsna were always the priority when associating with Tribhuvannatha, soothing the heart and mind. In 1979, we traveled to Hardwar and Rsikesh to study Srimad-Bhagavatam together and bathe daily in the frigid waters of the Ganges during winter time. 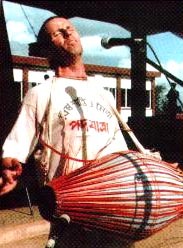 Kirtans were long and deep, as holy men and sages performed their ablutions, visibly curious about the white foreigner chanting the holy names of Krsna with such abandon and intensity. At sunset one evening (on Sivaratri no less) we came upon a glowing murti of Lord Siva sitting alone by the sacred river. His features were beautiful and glorious. Tribhuvannatha immediately started a roaring kirtan for His pleasure, and it was divine. Those were among the best days of my life, thanks to "good old Tribhu." "I am a rascal No.1 but somehow Srila Prabhupada has saved us. His pink Lotus Feet are our only shelter in life -- everything else is a bubble in the Sea!"